My husband is the kind of guy you would want with you in a foxhole. Me, not so much. I mean, if you wanted cookies brought in, or needed an overall organizing of the foxhole, you might want me there. But in general, I’m a little too “panicky” to be of much use. Logan, on the other hand, has nerves of steel. He does not get flustered. And he has a superhuman ability to stick with difficult/annoying/impossible tasks until they’re complete. Exhibit A: About 10 years ago during a brutal snowstorm, I accidentally dropped our car keys in the snow somewhere between our front door and the spot where I parked on the street. Logan and I dug around in the snow until 11 that night looking for those keys, but to no avail. A couple days later, after the storm had passed and we could dig out of our house, Logan rented a metal detector. He hunted around for a while and eventually found the keys — and the electronic fob that goes with them—in the middle of the street in front of our house. Apparently, I had dropped them onto the sidewalk, after which they were chewed up by a passing snowblower and spit out onto the street. The keys were fine, but the fob was broken into several tiny pieces. This was a bit of a problem, because without the fob, we couldn’t disable a security feature on the car that allowed it to start. A normal person would have called up Honda, ordered a new fob and waited a couple weeks for it to arrive. But my husband, with his superhuman can-do attitude, took the whole mess into our house, dug out his soldering iron BECAUSE OF COURSE HE HAD ONE, and painstakingly put the whole thing back together. Yes, it worked, and yes, we used it for years afterward. See what I mean? Foxhole material. Earlier this month, we took our children to the Oregon Coast for spring break. As we were driving in the rain down the winding highway, I had a flashback of being on the same stretch of road 17 years earlier. It was the day after Logan and I had gotten married, and we were making our way down the coast to Newport for our honeymoon. Our luggage was in the back of a little orange truck we had borrowed from his brother, and it was raining like crazy. Suddenly, the tarp that had been covering all of our stuff came loose and started flailing around in the wind. Logan pulled the truck over and hopped out to take a look, and as I sat in the cab, I thought, “So this is what married life with this guy is going to be like: random borrowed cars, things on the verge of breakdown at any moment, luggage getting wet under a tarp that has come loose on the highway during a rainstorm. This is my life now.” It was a sobering thought, because up until that point, my life had been governed largely by things that were new, functioning, and in control. I was a little worried that life with Logan would be anything but. I was surprised when he hopped back in the car a few minutes later, soaking wet but in good spirits, the tarp tied down and tucked back neatly around our luggage. Situation handled. Crisis averted. Our life together has been that way ever since. If there’s a problem, he works at it until it’s solved. If something seems hopeless, he takes my hand until I see the light. As we passed that same stretch of road a couple weeks ago, it struck me that now, instead of driving a tiny borrowed truck, we were riding in a Suburban filled to the brim with the family we had created. There weren’t just two little newlywed suitcases in the back, but duffel bag after duffel bag stuffed with little boy swim trunks and tween novels and rain boots in every color of the rainbow. The man sitting beside me was no longer a newly minted husband doing his best to show his bride that he could take care of her; it’s now simply a fact, proven to me countless times since that day. I never could have imagined 17 years ago how much my life with this man would give to me. But if there’s anyone I would follow into a foxhole, it would be him. Julia Ditto shares her life with her husband, six children and random menagerie of farm animals. 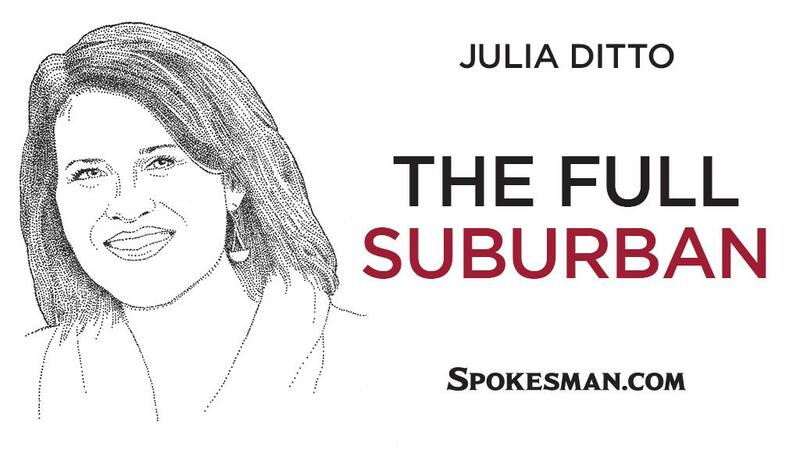 Her view of family life is firmly rooted in the Spokane Valley. You can reach her at dittojulia@gmail.com.